To celebrate the 80th anniversary of Penguin books they have released a selection of classic titles at just 80p each. It was everything I could do to avoid buying the full set, but I settled on 10 and I'm certain I'll be collecting a few more very soon. I thought for 80p that they would be stapled leaflet-y type things, but they're proper books just in miniature form. Very sweet and a great way to dabble in some classic works. I'm not the biggest fan but their new song has been in my head for a solid two days and it hasn't reached annoying levels yet. The video is also strangely hypnotic, in fact I think I like the video more than I like the song. Turns out they really are as brilliant as everyone says! All that I'm missing is the perfect light coverage foundation. I'm thinking of perhaps trying the NARS Tinted Moisturiser, but if you have any recommendations I'd love to hear them. I usually stick to bubble bath, but I've had a few bath bombs recently and really loved them. Watching them fizz away is really quite lovely and I must say that coloured water somehow make baths even more relaxing. I love the look of those Little Classics books they're adorable. Also I love the new song from Mumford and Sons as well! Thanks so much for including me in your fave blogs :) I've found some new reads in the others too! Also those Penguin books look so nice, definitely going to have a look into buying some! I was so excited when I found out about the Penguin little classics- I've ordered a few that I'm waiting to arrive but I know they are going to be addictive! Aw, thank you so much for including me! You're so thoughtful. I also adore the five things you shared: every single one. Totally diggin' minimal makeup right now! Ohh I didn't realise the little black classics were so cheap! I'll have to pick some up now! I totally get what you're saying about the new mumford song i cannot escape it! loving the look of the little black classics, didn't know they were so inexpensive! may buy a few for my friend's birthday (she's a bookworm like me so y'know) - love these types of post! I love the Little Black Classics, I only bought five but I might need to go back for some more!! I'm a fan of Penguin books too c; And darn only 80p each?! 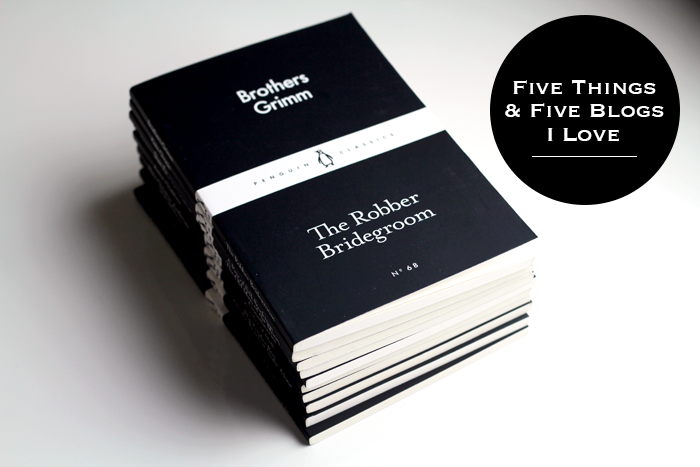 I just ordered four books from the Penguin Little Black Classics and I might return for more! !